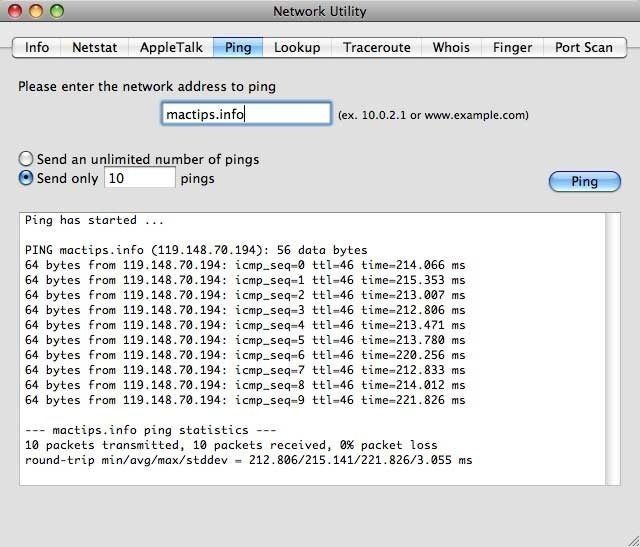 The following steps elaborate on how to use the Ping utility to perform progressively more distant tests on network connectivity. Successfully pinging the loopback address verifies that TCP/IP is both installed and configured correctly on the local client. If the loopback test fails, it means IP stack is not answering. If any TCP drivers get corrupted, the network adapter is not functioning properly, or any other service is interrupting IP , then lack of response might occur. Open event viewer and look for problems that setup or the TCP/IP service reported. Successfully pinging with the local client’s IP address verifies that the client was successfully added to a network. If one cannot successfully ping the local IP address after successfully pinging the loopback address, check that the local client’s IP address is a valid IP address, check the routing table, and check network adapter driver. Successfully pinging with the local client’s default gateway verifies that one can properly communicate with the local subnet to one’s local host, and default gateway is also functioning properly. If one cannot successfully ping the default gateway after successfully pinging the local client, check the default gateway. Successfully pinging with the remote host’s IP address verifies that the local client can communicate with the remote host through a router. If the remote host is located across a high delay link such as a satellite link, try using the -w (wait) parameter to specify a longer time out period than the default time out of four seconds. If one cannot successfully ping the remote host IP address after successfully pinging the default gateway, this indicates that there is no response from the remote host or if there is any network hardware problem between the source host and the destination host. To rule out the possibility of a problem in the work hardware, ping to a different remote host on the same subnet where the first remote host is located. Successfully pinging with the remote host’s name verifies that ping can resolve the remote host name to an IP address. If one cannot successfully ping the remote host name after successfully pinging the remote host’s IP address, the problem is with host name resolution, but not with network connectivity. When pinging the target host’s host name, make ping attempts to resolve the name to an address (first through a DNS server then through a WINS server, if one is configured), then attempt a local broadcast. Check TCP/IP properties to see whether the client has DNS server and WINS server addresses configured, either typed manually or assigned automatically. If DNS and WINS server addresses are configured in TCP/IP properties and if they appear when ipconfig/all is typed, try pinging with server addresses to ascertain whether they are accessible. On a network that uses DNS for name resolution, if the name entered is not a Fully Qualified Domain Name (FQDN), the DNS name resolver appends the computer’s domain name or name to generate the FQDN. Name resolution might fail if an FQDN is not used for a remote name. These requests fail because the DNS name resolver appends the local domain suffix to a name that resides elsewhere in the domain hierarchy. Hi.Please tell me whats the Loopback Address ?And what components are needed for setup an Ethernet(lan),(hardwares). I think your site is the best. Toda vez em que acesso a Internet o Mac Adress de minha máquina pode ser identificado pelo site que acessei, ou no caso de ter entrado em um site de bate-papo tipo orkut ou facebook????? Your MAC address cannot be seen remotely, but your IP address can. 267 queries in 0.621 seconds.